Spirit treadmills are some of the best in the industry and the Spirit XT9 treadmill is a high performance model in the new X-series that has thrilled both experts and everyday users. Home fitness buffs like the four transport wheels and the treadmill’s folding design which makes moving the Spirit XT9 around the house and storage an easy task, no matter your upper body strength. Features like a storage bin and cup holders provide space that is much appreciated. UPDATE: The Spirit XT9 has been discontinued. You can compare popular Spirit Treadmills at Amazon to find one of the current models that suits your needs. The Spirit XT9 is a great example of listening to the customer’s needs and giving them more than they expect. Experts find that Spirit treadmills are consistently giving the exerciser the opportunity to advance their fitness safely. 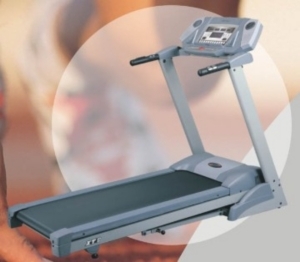 The large running area of the Spirit XT9 treadmill provides the new exerciser plenty of room to learn how to properly use a treadmill. Experts like the oversized rollers which reduce the workload on the motor and thus greatly reduce strain on the bearings. The XT9’s 3 hp continuous duty motor isn’t quite as powerful as other treadmills in the Spirit line, but that’s okay when you’re just starting out or don’t plan to break any records any time soon. For most everyday exercisers, experts find this to be more than sufficient. While the warranty for this Spirit treadmill is not nearly as long as other treadmills in the line, the high quality nearly guarantees you will not need to utilize it. Spirit Fitness consistently offers great products for their customers – just look at what the Spirit XT9 treadmill has to offer! But while this treadmill is a good deal for the price, you may want to spend another $200 to get more features and more power with the Spirit X10.